Old Particular North British 28yo (51.3%): Another random pick from the sample-yard... 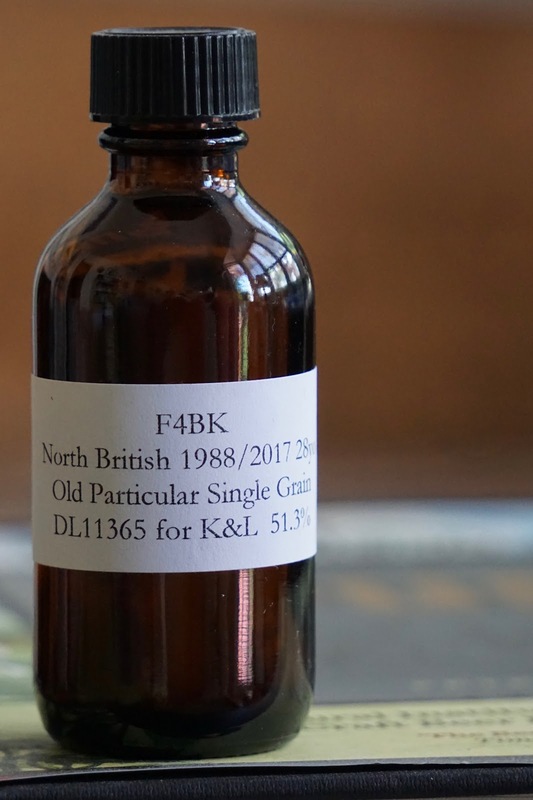 It is a 28yo single cask (DL11365) grain whisky sourced from North British Distillery located just south-west of Edinburgh. The whisky is distilled in 1988 and bottled in 2017 at cask strength by Douglas Laing & Co. under their Old Particular label exclusively for K&L Wine Merchants. By the way when I was researching for this post online I learned that North British Distillery's capacity is 65 million liters in a year... Sixty-five million..! Jaw dropping... Although it is not exactly comparable since the folks at North British are reaching this insane volume with column stills but they almost distill in a day what Kilchoman produces in a year. In one day..! Absolutely mind blowing..! Color: Bright yellow gold, Chardonnay color with tiny tear drops around the glass. Nose: Lemon juice and coconut flakes. Wintergreen Altoids and strawberries. Chalky and dusty... These dusty notes always hints wheat whiskey to me actually but I have no info about the type of grain the distillery was using in 1988. Floral notes to follow like jonquils and hyacinths, toasted marshmallows and confectioners sugar. With water it gets even chalkier. Wet wool, WD-40 and stainless steel water bottles. Palate: Sweet lemon cough drops, lightly toasted dry oak and white pepper. Limoncello, rice pudding and vanilla extract. That's about it... Dropping water also didn't add anything particular. Just about what I listed above but with a thinner mouthfeel. Finish: Short with white pepper and dried apricots. Overall: Well, it's an OK grain whisky but really nothing much more going on here... The nose kept me occupied quite a bit, I'll give it that but the palate didn't deliver anything exciting and/or interesting... It mostly feels like a grain whisky waiting for the right malts to show up so they can create a great blend... Very good pricing though. Thanks to Florin for the sample.